As a business owner I get wonderful people making suggestions that I would do so well with Zumba. It is truly a personal decision. While I have liked and enjoy Zumba, I chose to take a step up from the tradition Zumba certification classes and instructors. Here are some of the reasons that I have made this choice. Being located in the Center of the Northeast Arts District I feel that there is a need for creativity, improvisation, and talent and provide that opportunity here at SHIFT Fitness and Massage. I have many certifications in personal training and yoga but choose not to pay for the use of someone else’s trademarked product. With the music playing and the fun of dancing I truly forget that I am getting in a fantastic workout. As a Personal Trainer, I appreciate that Rene’s teaching style teaches us balance, flexibility as well as new steps and movements all the time. Some of us are re-shaping our bodies while having fun. While I do not know the creator of Zumba, I do know the heart and soul of the man that brought Cuban Salsa to the Twin Cities seventeen years ago. I was introduced in his teaching style in Jan of 2003. He received the 1st Pioneer of Twin Cities Salsa Award in 2013 and SAGE Award Nominee in 2015 “Outstanding Dance Educator”. He has over 30 years of professional dance performance and teaching. It is an honor to have him teaching at SHIFT Fitness and Massage Monday and Friday nights. Knowing music is great though I continue to use my voice I don’t play anymore. I appreciate that Rene teaches us to hear and feel the music. We have fun dancing in the studio and dancing to live bands around the city. 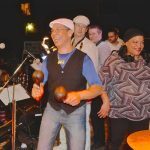 Singing with local bands like Charanga Tropical and his own band Q-Band, he knows what they play so we can feel confident in our dance skills and be exposed to their music and many others. While I may not have Zumba at Shift Fitness and Massage Studio, I do believe we have grown beyond Zumba. 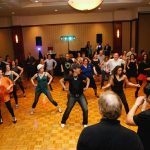 I have the best Salsa and Latin Dance (Cuban Style) teacher of the Twin Cities here. It is an honor to learn about the Cuban culture and background of the dances and an honor to learn from the best of the best. A friend of mine who is a Zumba instructor recently went to a Salsa Dance Party and she indicated that she could not dance with others. 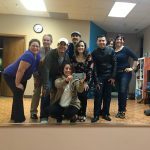 As Rene’s dance student I dance at these Salsa Dance Parties and fit in fine with Zumba classes.